Even how expensive, leading manufacturer, best brand, or certified your faucet is; it still undergoes “wear and tear” over time. Nobody wants to wish that their faucet will break, but it is a certain future that you want to be prepared for. One of the problems that can be encountered is with the handle. It may loosen or some screws can cause the problem. Like in any war, you must be prepared. The equipment that you need to prepare are the flashlight, screwdriver (that fits the screw of the handle, depending on the brand), and an adjustable wrench (crescent, or smooth), you can use a pair of channel locks if the wrench is unavailable. You also need a plumber’s tape (thread-seal tape) or replacement part – the ball lever, or set of screw. Aside from having the necessary equipment for the repair, you also need to prepare your workspace – in this case the sink, above and below. Remove things that may interfere with your repair that are found on the counter top such as soap dispensers. It is also best to cover the drain of the sink to prevent anything from falling down. Then remove things that are under the sink, things that may bump you (just for precaution). You also need to turn off the water valve that is usually found under the sink, use your flashlight for this. If you have hot and cold water, then you should turn off two valves, otherwise, there should be one. Check if the water valve is totally off by opening the handle of the faucet (there should be no water coming out). Now you are ready to repair your loose kitchen faucet. The first thing you need to check is the aerator. If the aerator is damaged, then it might not filter very well. Then check the appearance of the handle for any breaks or holes. Now you have to locate for the screw. In most cases, when you lift the handle/spout, the screw is there. Prepare the screwdriver that fits into it. Using your screwdriver, remove the screw gently and place it aside. Make sure you also check for the screw for its intactness. Remove the handle gently using your wrench, and inside you will be able to see the different parts of the faucet, starting from the cap. Remove the cap and the ball/lever; just make sure you know the sequence of putting them back in place. If the cap or the ball/lever has some crack areas, then you need replacement parts. There is no way you can repair that. If there are no cracks, then the cap is loose. Wrap the plumber’s tape around the cap. If there are some of loosening parts of the old tape from the cap, some would advise to actually remove or cut it. Then wrap of tape tightly with a few layers, perhaps 3-5 times. This tape will act as the seal to tighten the faucet. Now place back the ball/lever and the cap into place. Slide the handle back by hand, and tighten with your smooth wrench. Now re-screw the handle with your screwdriver in a clockwise motion. Make sure that it is snugly done. Then check the handle for any sensations of looseness (there shouldn’t be any). Lastly, turn on the water valves under the sink, and your faucet is now working properly. 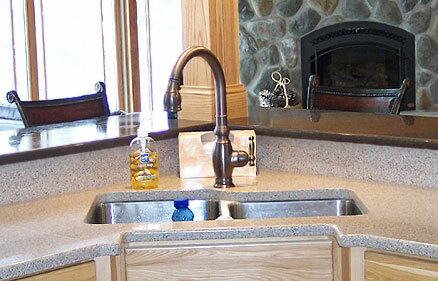 Most of the time, a loose kitchen faucet is just due to loose screw or loose handle. If that is the case, just tighten the screw or handle in a clockwise motion of the screwdriver or wrench. Situations such as where the faucet is mounted may also be the cause why it becomes loose. And repair of the faucet won’t do any good. Perhaps the water leaked and overtime rots the wood where the faucet is mounted. Therefore, there is a need to replace this material and not the faucet. Article written by http://www.kitchenfaucetreviewsonline.com/. Visit our website for more information. In case your kitchen faucet isn’t stable, the nuts securing them to the sink are usually the reason. You need to tighten them up. Firstly you need to identify the nuts. Depending on the faucet, the fasteners can be of plastic or simply those basic metal nuts. Once you get them, you need to do a good tightening. With help of slip-joint pliers do the adjustable basin wrenches. Don’t forget to use “plumbers grease” with reassembly. The faucet will operate much more smoothly.